GPSC Municipal Chief Officer, Labour Officer Jobs Recruitment 2018: Gujarat Public Service Commission released notification for the available Class 2 vacancies in Gujarat Administrative Services. There are total 37 vacancies in this GPSC Administrative Services Jobs recruitment. 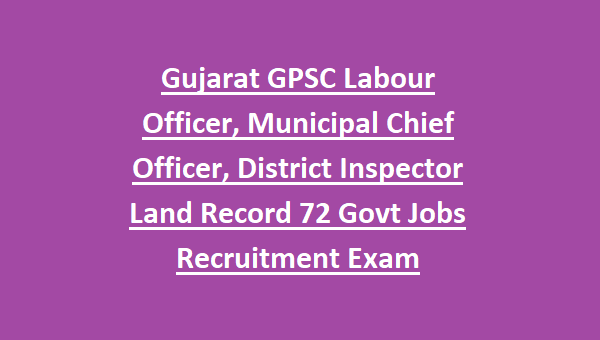 Available posts are District Inspector Land Record, Municipal Chief Officer and Labour Officer in this GPSC Recruitment 2018. Preliminary Exam, Mains Exam and interview will be conducted for this GPSC Administrative Services Class 2 jobs. 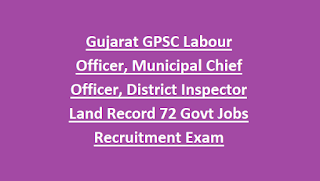 Eligible candidates can apply online for this GPSC Municipal Chief Officer, District Inspector Land Record Jobs through https://gpsc-ojas.gujarat.gov.in website on or before 01-10-2018. For more details regarding this GPSC Recruitment of Municipal Chief Officer and Labour Officer jobs Exam pattern and syllabus, selection process, how to apply online, age limits, salary and other information is given below. As on 01-10-2018 age limits are 20-35 years. For SEBC, SC, ST Male candidates and General Female candidates age limits are 20-40 years. For SEBC, SC, ST Female candidates age limits are 20-45 years. For all the posts degree qualified candidates are eligible to apply online. GPSC Administrative Services vacancies recruitment is based on Preliminary Exam, Mains Exam and interview. Preliminary Exam consist of 2 different papers. Each paper will be conducted for 200 marks and exam duration is 2 hours. Apply online for this Gujarat Public Service Commission Jobs Recruitment of Municipal Chief Officer, Labour Officer and District Inspector Land Record Posts. Online applications submission last date is 31-07-2018 through official website of GPSC @ gpsc-ojas.gujarat.gov.in.